Only five kilometres from the action and excitement of Surfers Paradise, the park is within easy reach of theme parks, shopping and local dining options. Being located close to the Broadwater, guests to the park can take a dip in the still-water frontage or launch their boat from the park’s own boat ramp. Idyllic waterfront paths extending north and south of the park are perfect for walking, cycling and taking advantage of the great outdoors. Choose from a wide range of accommodation options ideal for couples, groups, families and single travellers alike. 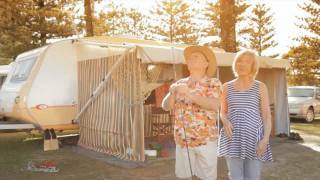 A variety of powered and ensuite sites are available for campers with a caravan, camper trailer, camper van or tent. Self-contained two and three bedroom villas sleep from four to ten guests. Villa styles include waterfront, waterview, pool and garden view (one fully accessible). Perfect for visiting the various Gold Coast attractions, well serviced by local buses and only one kilometre from the Southport light rail station. These waterfront villas are at the north end of park overlooking the beautiful Broadwater. Five Berth has one Queen, one Double with Single bunk over bed and four Berth has one Queen and one Bunk bed (all linen included). Villa features include a fully equipped kitchen with hot plates, microwave and fridge, air-conditioning, ceiling fans, LCD television with DVD player, Foxtel, front balcony with barbecue and outdoor table. Either highset or garden view available. Five Berth has one Queen, one Double with Single bunk over bed and six berth has one two Bunk beds (all linen included). Villa features include a fully equipped kitchen with plates, microwave and fridge, air-conditioning, ceiling fans, LCD television with DVD player, Foxtel, front balcony with barbecue and outdoor table. Highset villa is elevated with some views of the Broadwater and parking underneath, Garden Villa is low rise with garden views. Self contained two bedroom pool view villas all include linen and towels and sleep either five or six people with a Queen bed and either two bunk beds or a double with single bunk over bed in second bedroom. Features include a fully equipped kitchen with hot plates, microwave and fridge, air-conditioning, ceiling fans, LCD television with DVD player, Foxtel, front balcony with barbecue and outdoor table. Choose from a variety of waterview, ensuite, premium and powered sites. 201 powered sites and 24 ensuite sites. This family park is packed with facilities for all ages including two resort-style swimming pools (both heated during winter), recreation room, tennis court, children's playground (for all abilities), bouncing pillow, barbecues, camp kitchens and kiosk. The two bedroom deluxe villa is two-storey with spectacular views of the Broadwater. Sleeps up to eight with a Queen, four Singles (two bunks) and a Double Sofa Bed in the lounge area. Upstairs living area includes a fully equipped kitchen with dishwasher, oven, hot plates, microwave and fridge, air-conditioning, LCD television with DVD player, Foxtel, upstairs balcony with barbecue and outdoor table, washing machine and dryer. Spacious with plenty of room for friends and relatives. Positioned at the southern end of the park, these two bedroom villas offer superb views across the Broadwater. Five Berth has one Queen, one Double with Single bunk over bed and six Berth has one Queen and two Bunk beds (all linen included). Villa features include a fully equipped kitchen with hot plates, microwave and fridge, air-conditioning, ceiling fans, LCD television with DVD player, Foxtel, front balcony with barbecue and outdoor table. There is only 50 metres of grassed parkland between the villas and the beach. Self contained three bedroom villas all include linen and towels, two Queen and five Single Beds, fully equipped kitchen with hot plates, microwave and fridge, air-conditioning, ceiling fans, LCD television with DVD player, Foxtel, front balcony with barbecue and outdoor table, washing machine and dryer. Spacious with plenty of room for friends and relatives, these villas overlook the pool. This one bedroom villa is fully accessible by wheelchair, including a ramp leading to the front door. The open plan design enables comfortable wheelchair mobility throughout. The bedroom offers a queen size bed, with a double fold out sofa bed in the lounge (all linen included). The bathroom facility includes a disabled equipped shower, toilet and vanity, and wide door opening. There is a combined lounge/dining/self-contained kitchen area, air-conditioning unit, ceiling fans, Foxtel, front balcony with barbecue and outdoor table.